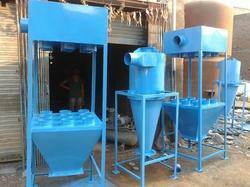 We offer industrial dust collectors that are known for optimum performance and enhanced service life. Our systems are not only cost effective but also energy efficient. Our expertise in manufacturing industrial dust collectors enables us to offer custom designed industrial dust collectors that will address client’s special requirements. Optimum utilization of latest technology and experience of years enables us to manufacture and exporter of a wide spectrum of industrial Dust Collectors that are designed to handle heavy dust loads. Our industrial dust collectors have blowers, dust filters, filter cleaning system and a receptacle or dust removal system fitted and it serves as a standalone unit. Known for efficient performance, the dust collector is also available in custom configurations as per specifications defined by the client.